On January 12, 1945, Flight Petty Officer 2nd Class Makoto Saegusa died in a special (suicide) attack at the age of 18 when submarine I-58 launched his kaiten manned torpedo at Guam Island's Apra Harbor. On December 30, 1944, submarine I-58 made a sortie from Ōtsushima Kaiten Base in Yamaguchi Prefecture with four kaiten pilots who were members of the Kaiten Special Attack Corps Kongō Unit. Saegusa was from Yamanashi Prefecture and was a member of the 13th Kō Class of the Navy's Yokaren (Preparatory Flight Training Program). He received a promotion to Ensign after his death by special attack. If a military man's life is a course of study in death, then it is expected that he should write something especially when facing this time. I just apologize for my lack of filial piety and my not staying in touch for a long time. Father and Mother always guide a child on the path to live life for the Emperor and for the country. I cannot suppress my joy at getting the opportunity now to repay to you a ten-thousandth of these teachings by only the best path of filial piety. In my opinion, although there have been many people from time immemorial, you do not hear about many persons who obtained a true place of death. However, I individually cannot accomplish what I desire. I appreciate that entirely due to kind acts of my ancestors I obtained a good opportunity that happens once in a thousand years. If on this occasion I can die splendidly, I am extremely satisfied that this is the key to repay a ten-thousandth of the kindness of persons who made me what I am now. It is a young man's long-cherished desire to be able to serve on a mission to repay the country. Please let my younger brother also follow after me. My original intention in dying for the Saegusa Family and the country was a promise to my brothers. Please send Older Brother a message that I promise to die splendidly. Finally, I earnestly apologize for my lack of loyalty and lack of filial piety until now. The letter and poem come from Kojima (2004, 25-6). The biographical information in the first paragraph comes from Kojima (2004, 25), Konada and Kataoka (2006, 125-30), and Mediasion (2006, 46, 48, 80). 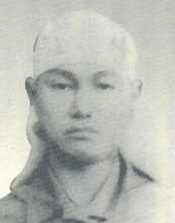 Kojima, Keizō, ed. 2004. Kaigun hikō yoka renshūsei isho • iei • ikōshū (1) (Last letters, poems, and writings of Navy Preparatory Flight Trainees (1)). Tōkyō: Unabarakai.